The pages of my many 1950s Life magazines are so brittle that they crumble into pieces as I gently turn them. 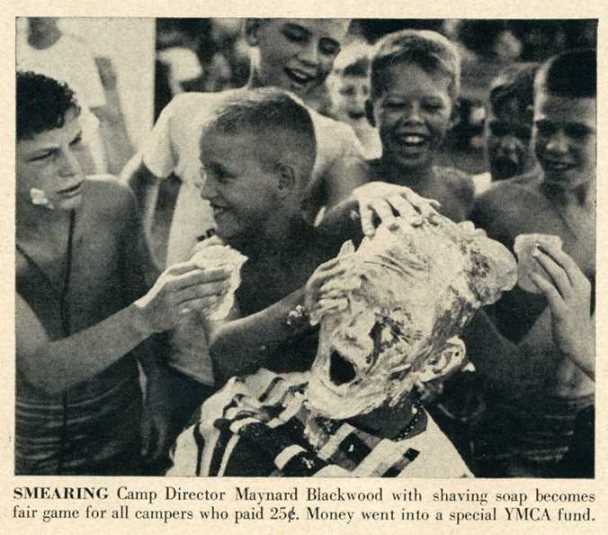 In an effort to preserve their fun images for posterity, I offer you scenes from a mischievous boys’ camp from summer 1954. Those boys were scoundrels! What nowadays could be construed as grounds for a lawsuit was all in good fun. I’m sure glad I was never the victim of a watery dawn raid. I used to read Life magazine any chance I had. I think Look had more pictures. Both were big glossy magazines I enjoyed as a kid. I think there may be a way to preserve those papers electronically. Not just with a camera. I hope you can save them. Well, surely they exist in the Life vaults. But us normal folks can enjoy these pics before they crumble apart. I scanned these three. Doesn’t that count? It’s taxing on only a cup of coffee and no sustenance yet. 😉 I shall keep scanning the best ones. No better place for a kid named Sparky. Sparky and I were pals! He is precious but the green is a little disconcerting. Yeah, they’re scoundrels, for sure. Next up, a hotfoot for the camp cook. Upon return home, they tie grandpa to his chair by the ankles while he naps watching Lawrence Welk. Oh, what character building, Kerbey. I love your brittle magazines, by the way. Great job sharing the photos for posterity. Thanks, Mark. It’s very Dennis the Menace or Dennis the Meanest, now that I read what you said. Probably no harm intended. I’m just the guy who hates these kinds of pranks all the way around, Kerbey. April Fool’s Day Bah-Humbug, if you recall. I hate pranks, too. The joking I like best is just watching “Last Comic Standing” on NBC. I am a fan of that show, too, Kerbey. Of course. Ha! 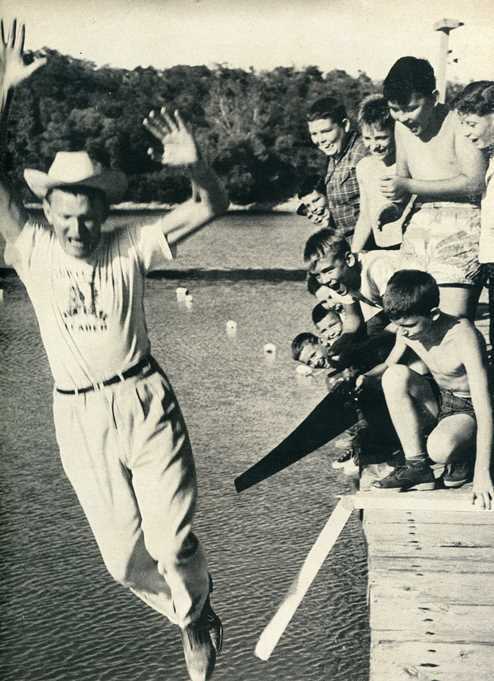 Too much fun – and a great way for the councilors to bond with the campers. Mind you it takes a special personality to encourage that. You know Kerbey when I was in about Grade 11 we were studying media production and our teacher was well connected. She actually got us studio time at a local cable TV station. We wrote and produced a made for TV play and we did the sets, all special effects and did all the studio functions except running the production board. We did the cameras, the stage management,, everything . It is quite a memory. Anyway, I digress. Being teens we did a farcical piece that had lots of creme pies in peoples’ faces. It turns out that creme is terrible on the face (and expensive). 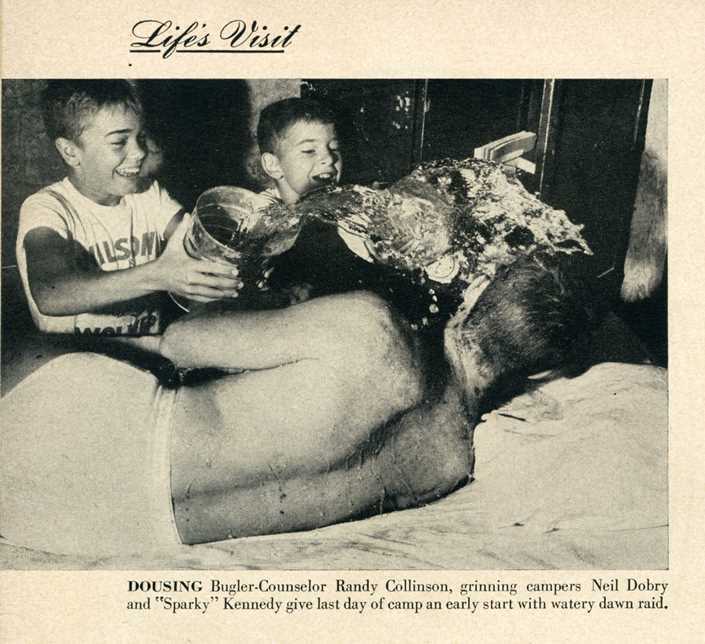 We experimented and found that shaving cream in aluminum pie plates, looked exactly like creme pies and was designed to smear on faces – it stuck just right and felt cool and wiped off easy, smelled nice, did not sting eyes and was fine to get in your mouth (and was cheap and didn’t stain clothing or props). Anyway, when I saw your photos it brought back that memory that I hadn’t considered for years. Thanks for the blast from the past. Oh, Paul, I wish you had a video of that! Well, at least you have the misty, water-colored memories. Wow, those magazines are almost eligible for social security! Impressive that they’ve held up for so long! I think even in this age, we’re still safe from “excessive shaving cream” and “water bucket wake-up” lawsuits! That camp sounds like tons of fun! Kerbey…picture idea!…Someday I’d love to see your stack of old magazines and/or photos. It just keeps getting more and more impressive the more you post! Thanks, Dave. You are welcome to come view them in their glass cases. Just open the door and yank one out. You have your magazine in glass cases?!? I’m so darn impressed! You’re a true historian! Or “a regular historian” as they used to say! I love how they used to call people “regular” and have it mean something super cool! That definition has certainly been lost! Truth. I used to be a “regular” at a sports bar, and that nothing to do with fiber. I’m glad it had nothing to do with fiber… or Activia! Sort of like Cheers but with trivia boxes. I watched basketball. Don’t recall boxing. I hope you preserve these precious magazines somehow. I am enjoying the title of this, too. My grandkids chant this “new” song on the radio. Definitely can relate to reading Life magazines, Kerbey. I was born earlier by 20 (or more!) years than you so that 1954 was close to when I was born. Horrors!